Mark O’Shea has been working in Papua New Guinea since 1986. He conducted herpetological surveys for Operation Raleigh in Western and Central Provinces. He then conducted venomous snake research and worked with medical professionals in Central and Madang Provinces, on the joint Oxford University Dept. of Clinical Medicine – Liverpool School or Tropical Medicine – University of PNG Dept. of Medicine snakebite research project through the 1990s and wrote the definitive A Guide to the Snakes of Papua New Guinea (Independent Publishing, Port Moresby, 1996). In 2000 he presented three films: Green Blood, Magic Man and Tree Crocodile, in the 2nd series of O’Shea’s Big Adventure, filming in Central, Western, Madang, Simbu, Southern and Western Highlands Provinces. In 2006 he launched a set of six stamps featuring the Dangerous Snakes of Papua New Guinea, which he designed for PostPNG (these stamps are available in special packs from the shop on this website). Mark was back in PNG, under the auspices of a Fellowship from the Dept. of Pharmacology at the University of Melbourne, to work as a member of the small Australian Venom Research Unit (AVRU) team with David Williams (AVRU) and Dr Wolfgang Wüster (University of Bangor) and alongside colleagues from UPNG Dept. of Medicine and Australian institutions. Papua New Guinea has a snakebite problem. Although neighbouring Australia (pop. 20M) suffers only 2-3 annual snakebite fatalities, PNG (pop. 5.5M), with many of the same or related venomous snake species, suffers at least 200 and possibly as many as 600 snakebite fatalities a year. PNG spends 25% of its medical drug budget on Australian antivenom and still runs out of stocks. Combined with corruption, theft and black-market resale of Australian antivenom within PNG, and the importation and sale of useless, even dangerous, foreign antivenoms, at vastly inflated prices, snakebite must feature as one of the most serious medical emergencies faced by Papua New Guinea. In some parts of the country more people die of snakebite than malaria, TB or HIV/AIDS. 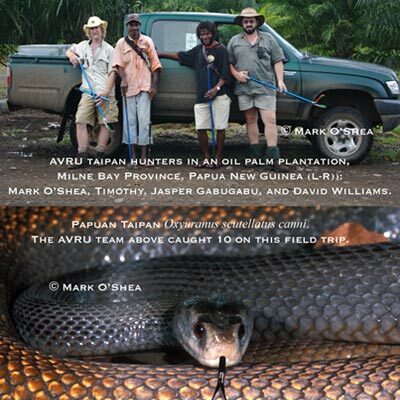 The AVRU team, led by David Williams, is determined to bring down the death rate through snakebite, work towards the production of cheaper and more efficient domestic antivenoms and reorganise the antivenom distribution system so that every snakebite victim has a chance of survival. To this end it is necessary to capture live and healthy specimens of the species responsible for causing snakebite across the country. In three short fieldtrips to Milne Bay, Oro and Madang Provinces in late 2006 Mark and David captured ten Papuan taipan, four New Guinea small-eyed snakes, a dozen death adders, two Müller’s crowned snakes and the first three New Guinea brownsnakes available from venom research. But this work is not without risk. Click on the following link to download the ABC Foreign Correspondent documentary featuring David Williams filmed in December 2007, during which David is almost killed by a large Papuan taipan. This is not a set-up, this is actual as-it-happens footage. If you would like to learn more about the life-saving AVRU PNG Snakebite Project please click on the link on the right. AVRU has now set up a Paypal account for donations to the project fund.